Tens of thousands of runners took part in the 2016 TCS New York City Marathon, completing a 26.2-mile course that spanned all five boroughs on Sunday, Nov. 6. Starting on Staten Island, competitors made their way to Brooklyn before dipping into Queens, Manhattan, the Bronx and then back to Manhattan to cross the finish line in Central Park. 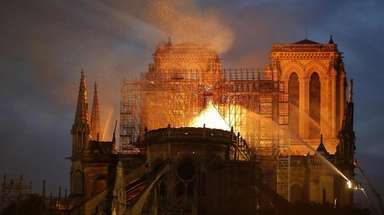 Scroll down to see photos of all the action. Mary Keitany of Kenya crosses the finish line to win the women's competition for a third straight year at the TCS New York City Marathon in Central Park on Sunday, Nov. 6, 2016. Ghirmay Ghebreslassie of Eritrea crosses the finish line to win the men's competition at the TCS New York City Marathon in Central Park on Sunday, Nov. 6, 2016. Ghebreslassie, 20, became the youngest runner ever to win the race. People leaving Lafayette Church of God watch runners make their way east on Lafayette Avenue in Brooklyn during the TCS New York City Marathon on Sunday, Nov. 6, 2016. A competitor grabs a Gatorade cup as he runs on Lafayette Avenue in Brooklyn during the TCS New York City Marathon on Sunday, Nov. 6, 2016. A dog looks on as runners make their way east on Lafayette Avenue in Brooklyn during the TCS New York City Marathon on Sunday, Nov. 6, 2016. An armed police officer stands guard as runners make their way north on First Avenue in Manhattan during the TCS New York City Marathon on Sunday, Nov. 6, 2016. Runners pass discarded cups on First Avenue in Manhattan during the TCS New York City Marathon on Sunday, Nov. 6, 2016. Supporters dressed as dinosaurs cheer on runners on Lafayette Avenue in Brooklyn during the TCS New York City Marathon on Sunday, Nov. 6, 2016. Hiroyuki Yamamoto of Japan competes in the professional men's division during the TCS New York City Marathon in Central Park on Sunday, Nov. 6, 2016. Participants run during the TCS New York City Marathon on Sunday, Nov. 6, 2016. Abdi Abdirahman of the United States celebrates with the American flag after finishing third in the professional men's division during the TCS New York City Marathon in Central Park on Sunday, Nov. 6, 2016. Participants stretch after running the TCS New York City Marathon in Central Park on Sunday, Nov. 6, 2016. 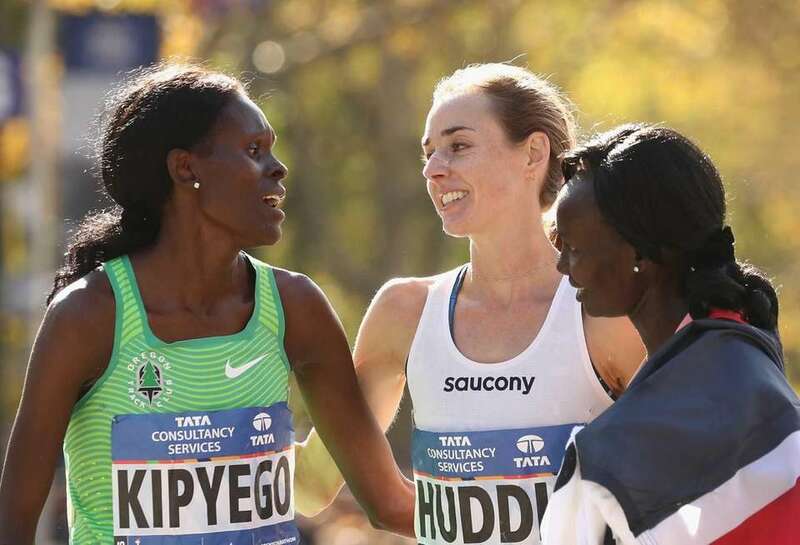 Sally Kipyego of Kenya, left, Molly Huddle of the United States, middle, and Mary Keitany of Kenya, right, embrace after the professional women's division during the TCS New York City Marathon on Sunday, Nov. 6, 2016. Participants run during the TCS New York City Marathon in Central Park on Sunday, Nov. 6, 2016. Women's first-place winner Mary Keitany of Kenya, runner-up Sally Kipyego of Kenya and third-place finisher Molly Huddle of the United States celebrate after finishing the TCS New York City Marathon in Central Park on Sunday, Nov. 6, 2016. Men's first-place winner Ghirmay Ghebreslassie of Eritrea, runner-up Lucas Rotich of Kenya, left, and third-place finisher Abdi Abdirahman of the United States pose with their medals after finishing the TCS New York City Marathon in Central Park on Sunday, Nov. 6, 2016. Joyce Chepkirui of Kenya runs in the TCS New York City Marathon on Sunday, Nov. 6, 2016. Mary Keitany of Kenya runs in the TCS New York City Marathon on Sunday, Nov. 6, 2016. She achieved her third consecutive marathon victory with a time of 2:24:26. Ayantu Dakebo Hailemaryam of Ethiopia runs in the TCS New York City Marathon on Sunday, Nov. 6, 2016. Runners cross the Verrazano-Narrows Bridge at the start of the TCS New York City Marathon on Sunday, Nov. 6, 2016. Senbeto Geneti Guteta of Ethiopia pours water on his head while running in the TCS New York City Marathon on Sunday, Nov. 6, 2016. Runners in the professional men's division cross the Verrazano-Narrows Bridge as the TCS New York City Marathon gets underway on Sunday, Nov. 6, 2016. Shadrack Biwott of the United States and Tadesse Yae Dabi of Ethiopia run in the TCS New York City Marathon on Sunday, Nov. 6, 2016. Men's first-place winner Mary Keitany of Kenya, runner-up Sally Kipyego of Kenya and third-place finisher Molly Huddle of the United States pose with their medals after finishing the TCS New York City Marathon in Central Park on Sunday, Nov. 6, 2016. Mary Keitany of Kenya, Molly Huddle of the United States and other runners in women's elite division cross the Verrazano-Narrows Bridge at the start of the TCS New York City Marathon on Sunday, Nov. 6, 2016. Runners cross the Verrazano-Narrows Bridge as the TCS New York City Marathon gets underway on Sunday, Nov. 6, 2016. Women's first-place winner Mary Keitany of Kenya, left, and second-place finisher Sally Kipyego of Kenya celebrate after finishing the TCS New York City Marathon on Sunday, Nov. 6, 2016. Competitors in the women's elite division cross the Verrazano-Narrows Bridge at the start of the TCS New York City Marathon on Sunday, Nov. 6, 2016. Runners in the women's elite division kick off their 26.2-mile trek through the five boroughs at the TCS New York City Marathon starting line in Staten Island on Sunday, Nov. 6, 2016. Runners cross through Brooklyn during the TCS New York City Marathon on Sunday, Nov. 6, 2016. Runners keep it moving during the TCS New York City Marathon on Sunday, Nov. 6, 2016. Runners stay on the move during the TCS New York City Marathon on Sunday, Nov. 6, 2016. Spectators cheer on their loved ones during the TCS New York City Marathon on Sunday, Nov. 6, 2016. Volunteers pour Gatorade into cups to pass out to runners during the TCS New York City Marathon in New York City on Sunday, Nov. 6, 2016. Participation medals are seen during the TCS New York City Marathon in Central Park on Sunday, Nov. 6, 2016. Marcel Hug of Switzerland celebrates after winning the men's wheelchair division at the TCS New York City Marathon in Central Park on Sunday, Nov. 6, 2016. Josh George of the United States celebrates after finishing third in the men's wheelchair division during the TCS New York City Marathon in Central Park on Sunday, Nov. 6, 2016. Josh George of the United States approaches the finish line to come in third place in the men's wheelchair division at the TCS New York City Marathon in Central Park on Sunday, Nov. 6, 2016. Manuela Schar of Switzerland crosses the finish line to finish second in the women's wheelchair division at the TCS New York City Marathon in Central Park on Sunday, Nov. 6, 2016. Marcel Hug of Switzerland, right, crosses the finish line to win the men's wheelchair division at the TCS New York City Marathon in Central Park in on Sunday, Nov. 6, 2016. Kurt Fearnley of Australia finished second. Marcel Hug of Switzerland crosses the finish line to win the men's wheelchair division at the TCS New York City Marathon in Central Park on Sunday, Nov. 6, 2016. Tatyana McFadden of the United States holds her gold medal after finishing first in the women's wheelchair division at the TCS New York City Marathon in Central Park on Sunday, Nov. 6, 2016. Tatyana McFadden of the United States celebrates with Bridget O'Shaughnessey, right, and Debbie McFadden after finishing first in the women's wheelchair division at the TCS New York City Marathon in Central Park on Sunday, Nov. 6, 2016. Tatyana McFadden of the United States and Marcel Hug of Switzerland shake hands after winning the women's and men's wheelchair divisions at the TCS New York City Marathon in Central Park on Sunday, Nov. 6, 2016. Amanda McGrory of the United States crosses the finish line to finish third in the women's wheelchair division at the TCS New York City Marathon in Central Park on Sunday, Nov. 6, 2016. First-place finisher Tatyana McFadden of the United States, right, celebrates with runner-up Manuela Schar of Switzerland after competing in the women's wheelchair division at the TCS New York City Marathon in Central Park on Sunday, Nov. 6, 2016. Marcel Hug of Switzerland and Tatyana McFadden of the United States hold their gold medals after winning the men's and women's wheelchair divisions at the TCS New York City Marathon in Central Park on Sunday, Nov. 6, 2016. Tatyana McFadden of the United States celebrates after crossing the finish line to win the women's wheelchair division at the TCS New York City Marathon on Sunday, Nov. 6, 2016. Marcel Hug of Switzerland holds his gold medal after winning the men's wheelchair division at the TCS New York City Marathon in Central Park on Sunday, Nov. 6, 2016. Tatyana McFadden of the United States crosses the finish line to win the women's wheelchair division at the TCS New York City Marathon in Central Park on Sunday, Nov. 6, 2016. An NYPD officer and a K-9 dog walk across the TCS New York City Marathon finish line in Central Park on Sunday, Nov. 6, 2016. Freebies and deals for NYC marathon runnersThese local restaurants and businesses are treating the runners right. Marathon runners share their inspiration for Sunday's raceThe marathon holds extra meaning for some New Yorkers. What happens to the NYC marathon runners' clothes?The TCS New York City Marathon has come a long way since 1970.